The Sierra 4-stage reverse osmosis system delivers gallons of clean, clear drinking water. The system features a 36 gpd membrane and top quality coconut carbon filtration in a four-stage configuration. 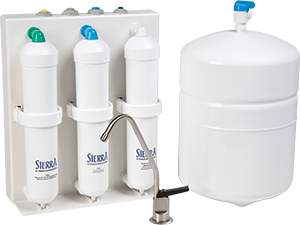 The Sierra is designed with hygienically sealed filter cartridges and color-coded fittings for fast installation and easy service. Shipped with a lead-free, air-gap chrome faucet.